Our funeral home traces its roots back to 1914 when Mr. William J. Murray first opened his doors for business as W.J. Murray Undertaker, located at 53 North Main Street. Thus the first funeral business came to be located in Porterville. In just two short years, Mr. Murray outgrew his facilities and a search for a more suitable location was begun. 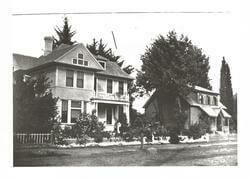 He carefully chose a large house at the corner of Mill and Hockett streets accross from the Post Office. He remoldeled the house and constructed a modern morgue along with other improvements. As was common of most undertakers of this era, the business also served as the family residence. It was inevitable that Mr. Murray made the acquaintance of a young man named Carl Loyd who was employed at the post Office. Carl, being young and enthusiastic, developed a keen interest in the undertaking business and before long, convinced Mr. Murray to allow him to study his trade. Carl quickly learned the undertaking business and in March of 1917 persuaded Mr. Murray to let him purchase it. Carl Loyd was well liked in the community and over the years proved to be a very good undertaker and businessman. He died suddenly of a heart attack at the age of 39. It was inevitable that Mr. Murray made the acquaintance of a young man named Carl Loyd who was employed at the Post Office across the street. Mr. Loyd, being young and enthusiastic, developed a keen interest in the undertaking business located across from the Post Office and before long, convinced Mr. Murray to school him in the trade. Mr. Loyd passionately embraced the undertaking business and in March of 1917 persuaded Mr. Murray to sell him the funeral home. Mr. Loyd was well liked in the community and soon proved to be a very good undertaker and businessman. 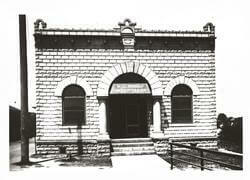 He renamed the business Loyd Funeral Service and oversaw a major building remodel in 1940. However, Mr. Loyd, at the age of 39 suddenly died of a heart attack. Without a succession plan, the funeral home passed through several ownership hands before being purchased in the early 1950’s by a young couple named Art & Kathleen Durchee. 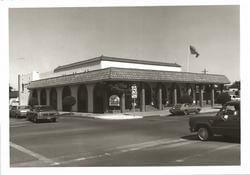 The Durchee family and their staff, faithfully served the Porterville and surrounding communities for many years and also oversaw a major remodel of the building in 1955. One staff member in particular, Clarence Peters, an apprentice embalmer from 1969 to 1973 would serendipitously play an important role in the funeral home’s future. Upon their retirement in 1989, Art and Kathleen sold their funeral business to the Whitehurst family of Fresno who re-named the funeral home Whitehurst-Loyd Funeral Service. The Whitehurst family owned seven funeral homes in the Central Valley and they made an immediate impression upon the community when they promptly set about painting, re-decorating and planting new landscaping. The staff remained all local residents and every attempt was made to improve the quality of service to the community wherever possible. However, now the first established funeral home business in Porterville could no longer state that it was locally owned and operated. The next decade also brought with it a divergent perception of funeral values as many local families began embracing cremation as an alternative to traditionally accepted ground burial. Coincidentally, this was also the time when The Loewen Group, a large funeral industry corporation acquired the Whitehurst family funeral homes. The Loewen Group retained all of the dedicated and well trained Whitehurst -Loyd staff but now operating decisions were being made from the Loewen corporate headquarters in Canada. Whitehurst-Loyd Funeral Service served local families under this structure until July 1, 2007. Local ownership of Porterville’s first established funeral home came back full circle when native son Les Peters and wife Kim purchased Whitehurst -Loyd Funeral Service on July 1, 2007. Les is the son of Clarence Peters, the apprentice embalmer who in 1973 struck out on his own to fulfill his dream of owning his own funeral home. Like many offspring of small business owners, Les at the age of 15, promptly began helping wherever he could and with the tutelage of Clarence, developed into an excellent funeral home operator in his own right. Les and Kim are committed to reestablishing the core concept of being an exclusively locally owned and operated funeral business. To learn more about Les and Kim personally, visit their biographies on our website Home Page.